One of the many things that contributes to the diversity of Spring Leaves Family Learning is having guests share with us a special interest of theirs. Some of these people are teachers, some are parents or grand parents, and some are simply members of the community that love what they do and love communicating with anyone else who is interested. 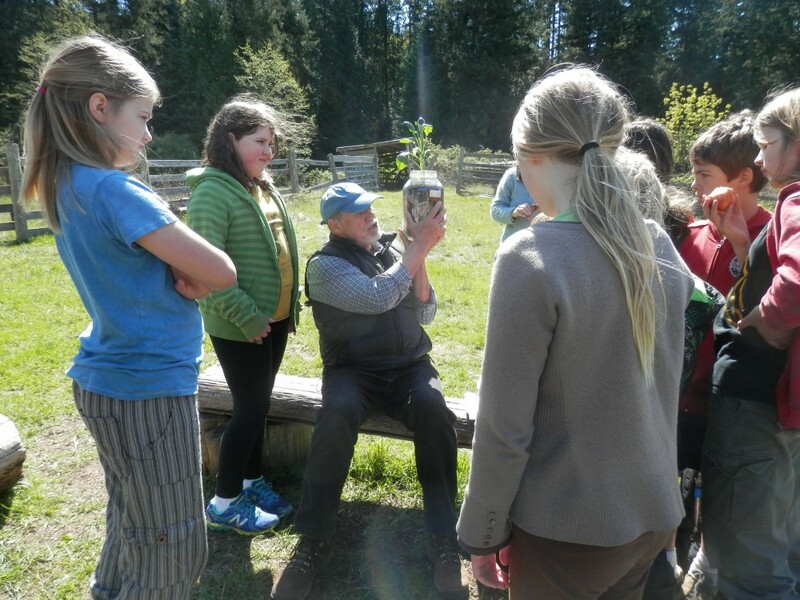 We welcomed a new resident to Pender Island by inviting him to share with our group his love and knowledge of building and growing mushroom gardens. Don Ollsin has been doing this for a long time. His own education in herbalism began in the early 70’s and has continued ever since. Don received his Master Herbalist’s degree from the Emerson Institute and soon began teaching classes on herbs and healing, eventually broadening his activities to include lecturing and giving workshops with noted authors and teachers. Over the years he has created many herbal programs and has taught at many colleges and universities. He is the author of Pathways To Healing: A Guide to Ayurveda, Herbs, Dreambody and Shamanism. In 2013 Don completed his MA in Environmental Education and Communication at Royal Roads University, and directs his teaching through environmentalism, community and sustainability. On a sunny spring day, we met with Don to learn to create a fungi garden-a food garden consisting of wood chips, soil, edible fungi (in this case, Stropharia rugoso-annulata), and vegetables or herbs. It becomes a thriving ecosystem complete with everything from microorganisms, plants, insects, birds, animals and people. This is from Don’s website, www.grassrootsherbalism.com: Using a carefully calculated organization of wood chips and fungi in a properly chosen location we create the foundation of our future ecosystem. By the addition of some seeds, a bit of soil and whatever plants we want to plant we set the stage for the creation of life. As the spawn breaks down the carbon in the chips and releases oxygen, the seeds and plants begin to use these to grow. Once the spawn produces its fruits (mushrooms) the insects discover them and eventually lay their larvae in them. Then the birds discover the larvae and while feasting leave behind rich droppings of nitrogen adding to the primordial bed of fertility. Once there is food available in the way of mushrooms, plants and birds, larger animals and people enter the system. Now we have a complete ecosystem. That is why we create Fungi Gardens. We picked a spot, with moisture and sun, and laid down cardboard over the grass. Then we spread newspaper over that, and laid down the wood chips. Don shaped the wood chips into small troughs, into which everyone placed a handful of the spawn- or innoculated wood chips of the Garden Giant mushroom. Then we covered that with newspaper, which we also soaked with water before adding soil. We went off into the forest to find some plants to put into our garden, and found miners lettuce, wild strawberry, dandelion, and a few others. Don also had some clover seeds to spread over all the soil. I just find this whole system utterly amazing. Thanks to Don, we created our own window into the world of this alternate web. Eventually we will be able to see the growth of the mycelium, the growth of the plants’ roots, and the places where they connect. 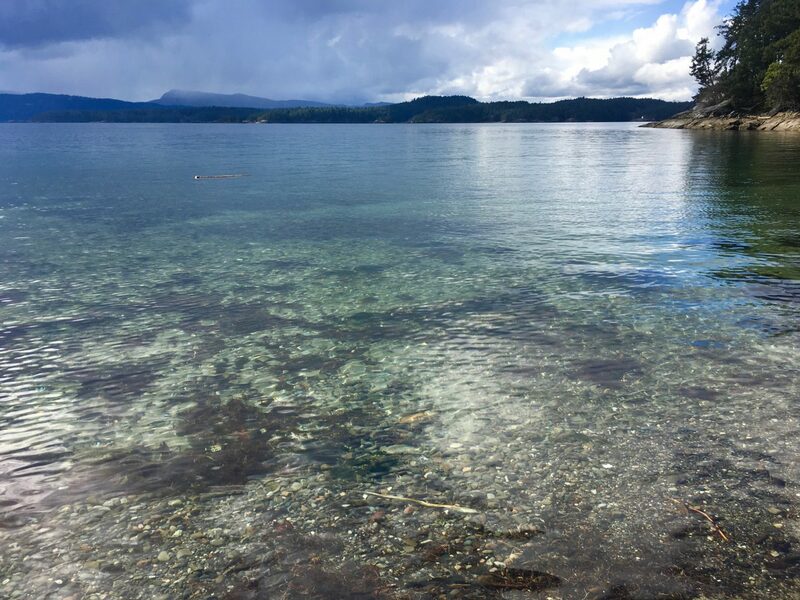 Welcome to Pender Island Don! We look forwards to more learning exchanges such as this. Carol Anne Ciocco – astronology consult and writer of wonderfully poignant newsletters. Cob Works From Mayne Island, BC, Cobworks provides training in, consultation, and construction services for earthen home construction, and offers workshops all over North America. 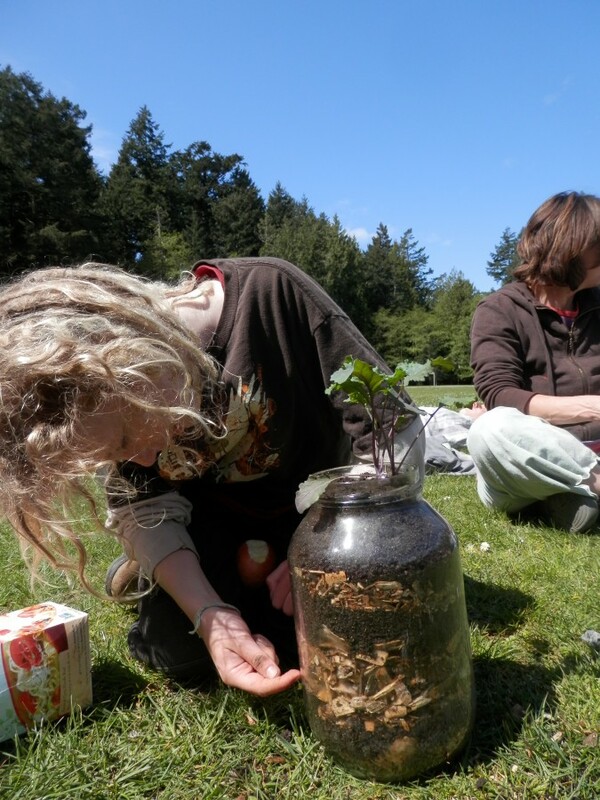 Grass Roots Herbalism Helping people cultivate a deeper relationship to the plant world with books, courses and programs in self healing, grassroots healing and earth healing. Jam Camp Family music camps for all ages and skills. Joanne Green- Elysium Art beautiful artwork. Pender Penguins A journal and data base of the observed ocean life seen by our local group of island snorkelers. Richard Shilling Beautiful Land Art creations from the UK. The Eco-Homes Network A group of builders promoting natural building methods. The Homeschool Co-op Supporting homeschoolers with ideas and discussions. The Sweet Lowdown New oldtime bluegrass female vocalists-just listen. Twisted Vine Farm Raising families, natural building, beautiful gardens, amazing people. Young Oldtime Music and Dance Association square dancers and callers unite!